The Plot: 80s stock character Mike Harrigan (Danny Glover) seems to be the only cop in 1997 Los Angeles who can get results. The city is currently in the throes of a brutal gang war between the Colombians and what is actually referred to as King Willy’s Jamaican Voodoo Posse. Things only get more complicated when Colombians, members of the KWJVP, and cops all begin turning up dead, and not just regular dead, mind you, skinned-alive-spines-and-heads-missing kind of dead. The culprit? You guessed it: another one of those aliens that Arnold Schwarzenegger fought in the jungle. 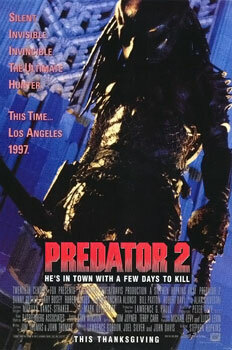 So, following the success of 1987’s Predator, it was not entirely irresponsible of studio execs to demand a sequel. And in fact, not every decision made during this production was an all-out terrible one. I got the impression that a number of very good ideas went into this movie. Translating the Predator to a city instead of a jungle could have been interesting. The film’s climax begins to almost play with the idea of thinking about maybe exploring the alien’s culture. That would have been interesting. Including Danny Glover but not Mel Gibson could have been interesting. But the filmmakers only flirt with these concepts, and never really use any of them to their full potential. Instead, they opt to set the movie in the future 90s and sport a supporting cast of B-listers including, but possibly not limited to, Gary Busey, Rueben Blades, and, of course, Bill Paxton. Ladies and gentlemen, Bill Paxton. Oh, Bill Paxton. 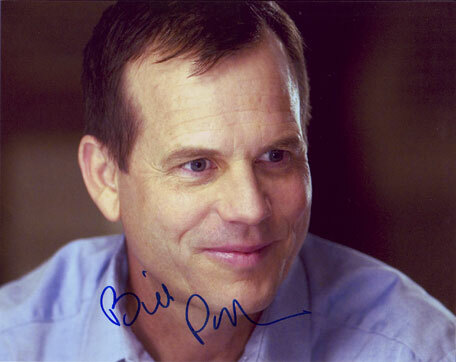 My dear, dear Bill Paxton. Understand, dear reader(s), that many of Predator 2’s weaknesses are also its strengths. A lot of things fall into kind of a grey area. Bill Paxton is one of those things. Just as Danny Glover plays Danny Glover, or as Gary Busey plays a psychotic government agent/conspiracy theorist, Bill Paxton plays Bill Paxton, and he does a really superb job. There’s a video on YouTube, which is a compilation of every line Paxton utters in Aliens. Surprisingly, the YouTube video tells you pretty much everything you need to know about both Bill Paxton and his role in Predator 2. He plays these loud-mouthed, stupid, cowardly characters and makes them almost loveable… almost. Actually, that description isn’t totally fair. Predator 2 Bill Paxton isn’t cowardly. In fact, he bravely defends a group of civilians by standing alone against the Predator, using nothing but 90s slang and a sequined handgun to defend himself. It goes about as well as you’d think. I think Predator was such a huge success because its monster was brand new. Nothing like that had ever graced the screen. The Thomas brothers managed to create the ultimate predator. It could turn invisible, shoot lasers, move silently, see in infrared; it was strong; it was smart, and it looked really cool. In Predator, they’re showing off their new toy and everyone is really impressed. Everyone buys it. In Predator 2, they seek to boost sales, not by making another awesome new monster, but by giving a spear and a sharp Frisbee to the old one and calling it L.A. Vacation Predator. That was a mistake. They did not get to make Christmas Vacation Predator. They missed out on that market. Surprisingly, I have more to say about this movie. Maybe I’ll do a sequal sometime, but I realize that I still need to explain something very important: why I have just written a review of Predator 2. This is the movie to which I compare all other movies. Why? Because it’s bad, but it’s not the worst movie I’ve ever seen, and it was kind of enjoyable. I wanted to pick a movie low enough to include all those good bad movies and to tell you that any movie lower than it is one that you never want to watch. Like Starship Troopers. Anyway, if you enjoyed this, I will be here every Sunday to give you a superfluous meal of movie criticism, because only Hobbits care what college students think about movies, apparently. Enjoy your Second Breakfast, kids.